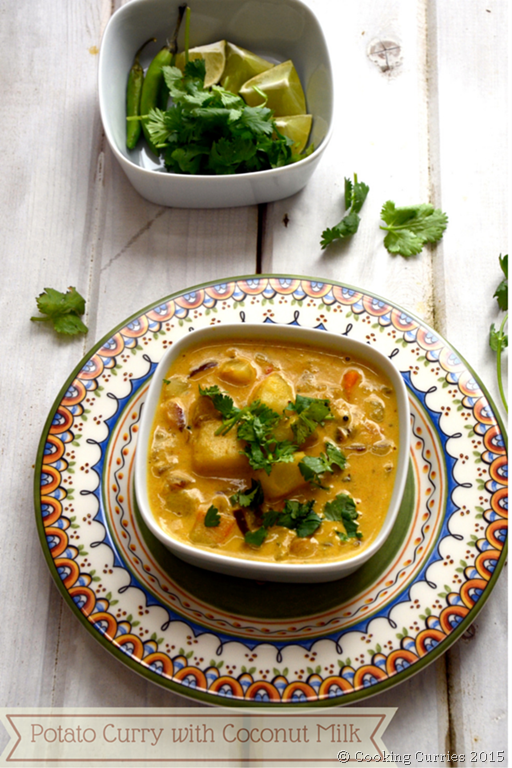 A quick and easy recipe for a weeknight dinner, this Kerala Style Potato Curry with Coconut Milk is mildly spiced with subtle flavors of the coconut milk and spices coming through. It is also an excellent Vegan recipe to make alongside rice, rotis or any other kind of bread. The ten days of Navarathri are days of fasting. Different people do the fasting different ways. What we do in our family is to not eat meat / eggs (eggs in my case, as I don’t eat meat) or drink alcohol. I tried the no onion, no garlic deal like my parents do, but I just could not do it. So we chose this diet for our fasting and we have stuck to this for a few years now. This potato curry with coconut milk is a modification of my Kerala Style Egg Curry except without the egg but potatoes instead. And it kinda makes it a Vegan Potato Curry recipe as well. I changed up the spice mix just a little bit, but for the most part this is very similar to the egg curry and tastes like it too. I added some khus khus / white poppy seeds to the spice mix, so it has a little bit of the kurma flavor also, especially when combined with the coconut milk. 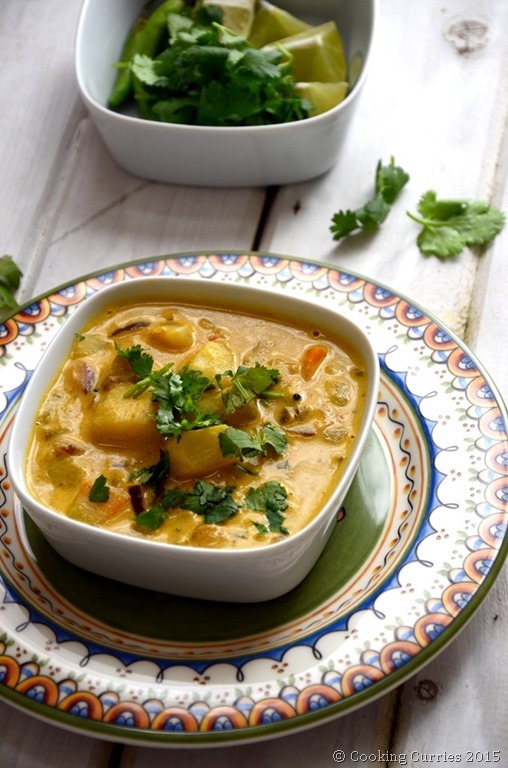 A great dinner recipe, to go with your rotis. Make a drier veggie side, if you want to. I made this Kothavaranga Usili and some mixed baby greens salad to go with it. Boil the potatoes and carrots until soft, drain and keep aside. Heat the oil in a kadai (wide and deep saute pan), add the mustard seeds and let them splutter. Add curry leaves and give it a quick stir. Add the onions and ginger garlic paste. Saute till the onions are cooked and light brown. Add the crushed spice mix, turmeric powder and cayenne.Saute till the raw smell of the spices go away. Add the tomatoes and saute till they are soft. Now add the salt and black pepper and mix well. Add the cooked potatoes and carrots along with coconut milk, mix well and let it start to steam. Dont let it come to a boil, as the coconut milk might separate. Remove from heat and garnish with cilantro. 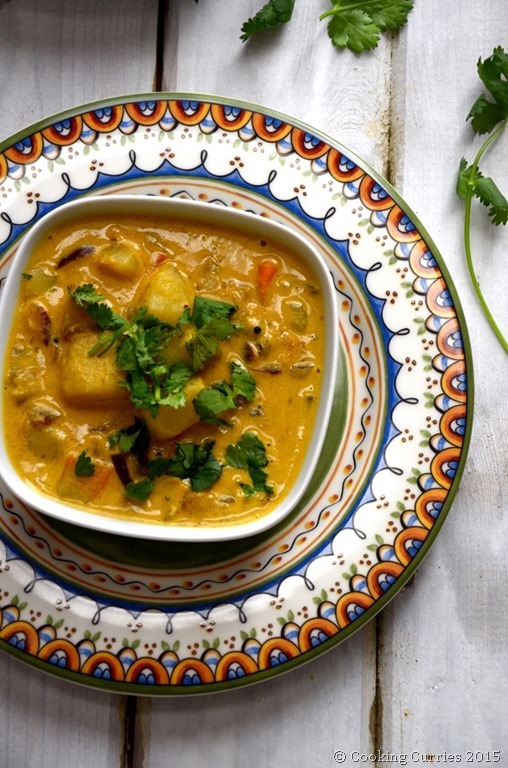 Serve hot with rotis, naans or rice. You didn’t mention when to add the potato and carrot ? Yes! It just skipped somehow. So sorry! Added it now. Thank you for pointing it out. OMG! yes! I have added that to the steps now. Thanks for pointing it out.